At the end of October, I had to skip the Hot Chocolate 15k because I was in too much pain to really run any distance, even short ones. Then last week, I changed my entry from the F^3 Half Marathon to the F^3 5k because I'm not supposed to be running more than a few miles at a time right now. To say that I'm disappointed is an understatement. Even though I know that it is the right decision, I feel like a failure. And I'm worried that this is becoming a trend for me, where I sign up for races and then can't run them. I'm starting to get a little gun shy. There are a lot of races coming up this year that I want to run, but now I'm afraid to register for them because I don't want to have yet another let down if I can't run them. I really miss winter running. I admit that I get jealous when I see so many people I know posting about their half marathon training and long runs and speed work while I am stuck cross training and doing short, slow runs. I am happy for my friends who are gaining speed and endurance and crushing their goals, but it is hard not to compare myself to them. There are days when the "woe is me" thoughts take hold. I've had days recently when I wake up and think, "I'm not a runner, anymore, so why bother." I'm trying to find ways to deal with these feelings, but it isn't always easy. My brain keeps telling me that I'll never get back to where I was, that I'll always be struggling to keep up with everyone else, that I'll never be good enough. Even though these thoughts are hard to ignore, I'm finding ways to deal with them. Setting new goals. My original goal this winter was to set a new half marathon PR. That is obviously not going to happen now that I've had to switch distances. Instead of having specific running goals at the moment, I have changed to having overall fitness and health goals. My new fitness goal is simply to regain the fitness that I've lost. I'm working on regaining my strength and endurance and flexibility so that I will be in a better place when I am able to start running again. I've also set goals for overall health, because I've fallen into some bad habits. I'm cooking more at home, getting more sleep, and making sure that I'm well hydrated. I'd forgotten how much I enjoy cooking. Making fitness "appointments." It can be hard to get out of bed for a workout when your mind is telling you that it is a pointless endeavor, but knowing that there is another person who is expecting you to show up at a specific time and place makes it a little easier. I've started making plans to workout with friends a couple of times a week, and it has helped me stay on track the last couple of weeks. I'm less likely to skip an early morning or an after work workout when I know that someone else is expecting me because I don't want to let them down. And having someone text you at 5:00am to remind you that you committed to taking a 6:00am spin class with them and they are going to sign you up for a bike as soon as they get to the gym doesn't hurt (thanks, Eileen). I'm not a morning person, so making sure that there are people waiting for me at the gym gets me out of bed at 5am. Making recovery a priority. I want to run, so I'm doing everything I can to make sure that I will be setting myself up for success when I start running again. Rather than dwelling on not running the race I signed up for, I'm trying to focus on preventing future injuries. 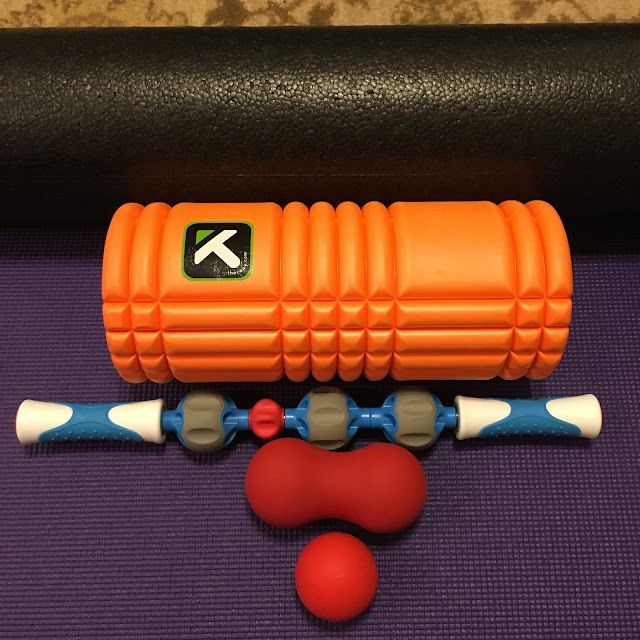 Stretching, foam rolling, and working to strengthen my weak areas have become my priorities. Behold! My implements of torture! Why does everything that is good for you have to feel so bad?